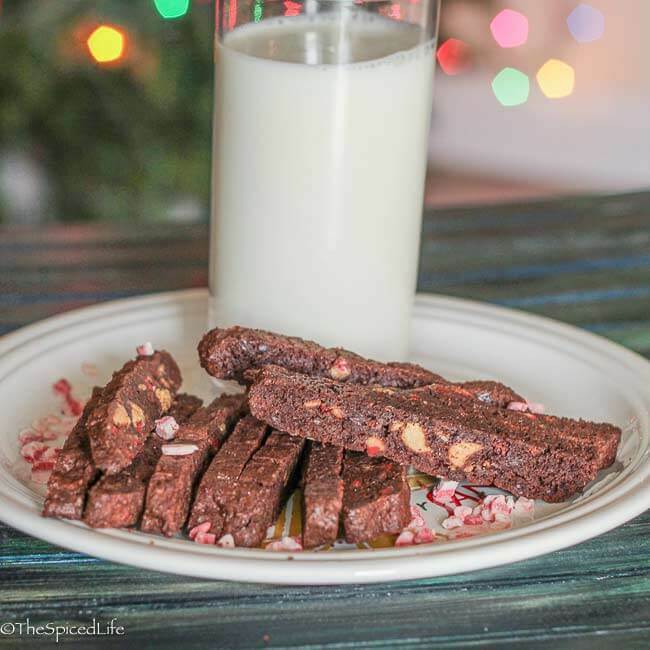 These Peppermint Chocolate Biscotti are my favorite Christmas cookie, and a holiday family favorite as well! I make these every year, so I have updated the photos more than once. However, since my original post bemoans the fact that they are tricky to take pictures of, I have left some of the originals. And yes I still find them tricky to photograph! This is one of those instances when I am so sad I could not get the appearance of the finished cookie to match its complete awesomeness. It’s the perfect Christmas cookie, especially if you like mint chocolate the way I like mint chocolate. It is also perfect because biscotti, of course, are one of those great keeper cookies that can live in a Holiday tin on your dining room table for a month without problem. I think I slightly underbaked them during the first stage, which led to not very pretty slices, but truly do not let that stop you from making these Peppermint Chocolate Biscotti. Other than looks, they are easy, and no matter how they look they are delicious. I like biscotti with a crumbly mouth-feel, as opposed to being rock hard and needing a dip in coffee. In other words I prefer biscotti with some fat! 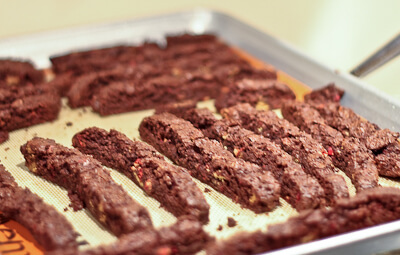 The tender crunchiness of these biscotti is further improved by pulverizing part of the flour/cocoa mixture with bittersweet chocolate. By the way, Andes Peppermint Crunch Baking Chips are one of the secrets to my holiday cookie baking. I have never found chopped up candy canes to be as easy to work with as advertised, nor as easy to chew after being baked. The Andes chips substitute perfectly, and I now keep them on hand for this recipe, as well as other peppermint endeavors. Preheat the oven to 300 F with a rack in the center of the oven. Whisk together the flour, cocoa powder, baking powder and salt. Remove about ¼ cup and place it in the food processor with the blade attached. Set the rest aside. Add the bittersweet chocolate to the food processor with the flour mixture and process until completely pulverized. Add back to the flour mixture. Cream the butter and sugar together until completely integrated and creamy. Mix in the eggs and vanilla--if using a mixer, mix on speed 2 or lower. Add the flour and mix on the lowest speed, just until all of the flour has been evenly moistened by the butter-egg mixture. Stir in the peppermint baking chips and the white chocolate. 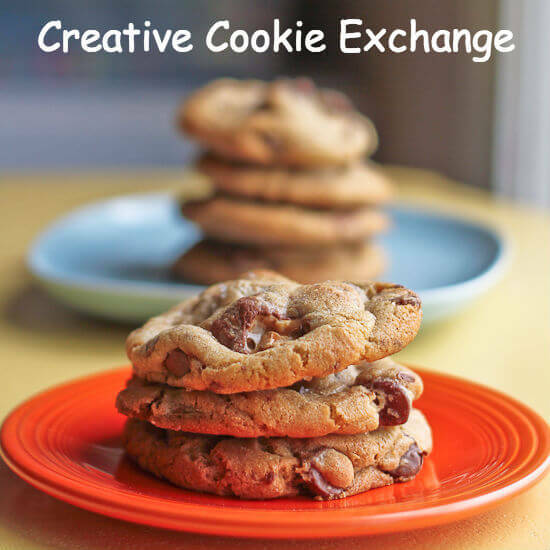 Place parchment or a silicone mat on a cookie sheet. Shape the dough on the cookie sheet to form a long rectangle, about 16X4 inches for long biscotti, or 2 shorter and more narrow logs for shorter biscotti. Bake for approximately 35 minutes (start checking at 20 minutes if baking 2 logs), until the loaf is firm but springy to the touch. Rotate from front to back halfway through to ensure even baking. Obviously do not let the loaf burn, but in light of my experience with a loaf that was almost too soft to slice, I would err on the side of overbaking. At 300 F this is not too risky. Remove the loaf to cool on the pan. Let it cool for at least 2 hours and up to overnight. Before slicing, turn the oven back on to 300 F. Remove the loaf or loaves–carefully!–to a cutting board. Slice ½-inch slices of the loaf and transfer them back to the cookie sheet, placing them ½ inch apart. If you need to, use 2 cookie sheets and place the oven racks in the lower and upper third of the oven. Bake for an additional 35 minutes, until the biscotti feel dry and crusty (they will not feel perfectly hard though, that will happen as they cool). Rotate from front to back (and top to bottom if using 2 sheets) halfway through. Cool the biscotti completely before storing in airtight tins. 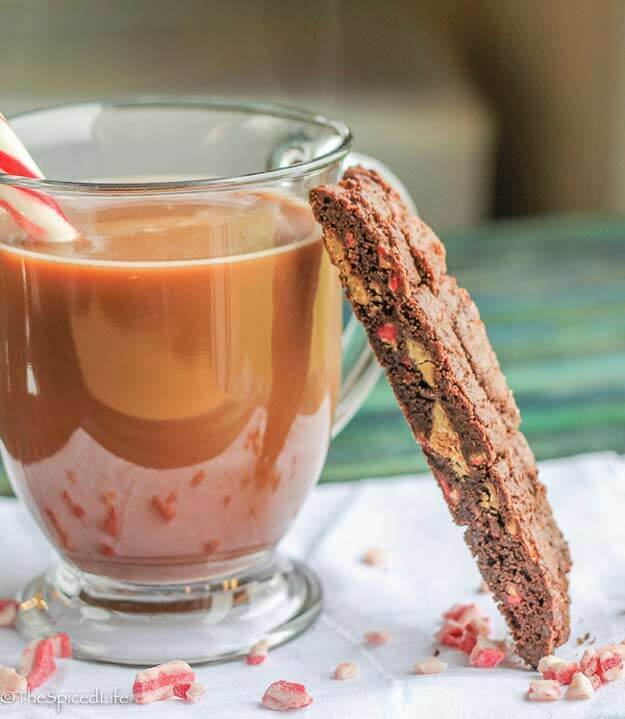 Chocolate biscotti are the best, and the peppermint seems like the perfect holiday addition 🙂 Looks wonderful! These look delicious! I too get frustrated when my food doesn’t turn out looking like I think it should. Don’t worry though, these look like a true winner! I have never tried the Andes baking chips (or even seen them anywhere) so I’ll have to see if I can get my hands on some of those. Thanks for the tip! Hubby came by my desk while I was reading this and has informed me that I MUST make them. He was totally drooling. They do look delicious and it looks as though they’ll be a part of breakfast here in the near future! Thanks for sharing. I love the idea of the peppermint and chocolates – like a giant after eight mint…Yum. I love biscotti! They’re the perfect dunking cookie!! And I am in love with this peppermint chocolate flavor! I really want to make these this year. Where did you find Andes chips? Honestly all of my local stores have them this time of year. Walmart, Kroger, all of them. So unless it is a regional thing you should have no trouble finding them. These are perfect! For some reason those chips are not easy to find in Fort Worth. The biscotti are lined up like little chocolate soldiers on the cooling rack and smell fantastic. I had to eat the ends of each loaf, of course, after the first bake. Those are the cook’s treat. I did add 1/2 tsp of peppermint extract to your recipe. The 2 hour wait for slicing allowed me to make perfect slices. This is a very good recipe that will become a holiday tradition! These biscotti are delicious and just can’t flop. I’ve made them dozens of times and they’re wonderful. The last few times I’ve made a few changes: replaced half the vanilla with peppermint extract, used mini chocolate chips instead of pulverizing the bittersweet (I have done this out of necessity since I no longer have a food processor), and use more Andes baking chips instead of the white chocolate. Then I drizzle white chocolate (with peppermint extract added) on top when done. People ask me all the time if I sell them! 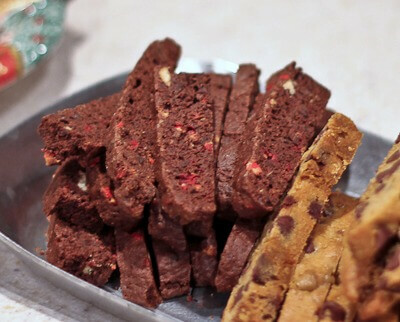 The chocolate mint biscotti recipe sounds so delicious! Every Christmas. I start out saying I want to try out new recipes & by the time I get half way through my baking I’ve only added different things to my previous favorite recipes. I might get adventurous & try baking this as Christmas is over & I have more time & patience. The chocolate cookies with peppermint bits in them sound awesome too! This made me laugh, I know exactly how you feel only in reverse, often I end up making too many new ones and not enough of the classics.